A DIFFERENT BREED: Woodley (as Tris) and James (as Four) in the Neil Burger-directed film. Unsurprising then that, upon discovering that she's one of those rare birds who transcend the factions, young Tris (The Descendants' Shailene Woodley in the female lead) must do everything in her capabilities to keep the truth about herself hidden, in a place where the cold idea of "faction over blood" can't be stressed strongly enough. 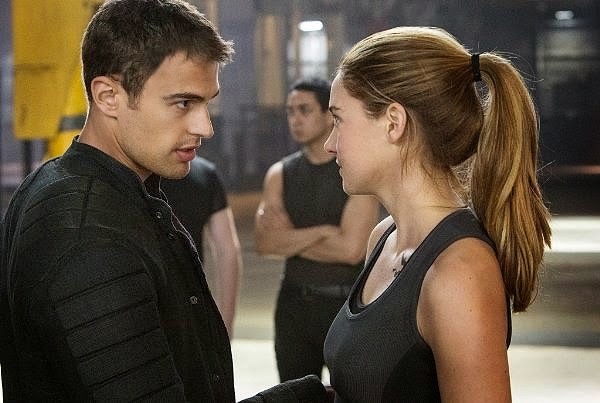 Even as it paints a vividly compelling portrait of the steep cost of outsiderdom, Divergent delivers unmistakable echoes of The Hunger Games, in its unflimching depiction of a heroine worth rooting for, survival in the face of insurmountable odds, and a dystopian society governed by a ruthless intelligentsia. Woodley, superb as the headstrong Tris, heads an accomplished cast that includes supporting roles for Ashley Judd and Scandal's Tony Goldwyn as Tris' good-natured parents; rising actor Ansel Elgort (Carrie) as her wayward brother; and Theo James as a tightly wound big-brother type who ends up taking Tris under his wing.